Today is Day #198 of the Just For Today Challenge. I am also integrating the Live Happy into my daily Challenge. The Live Happy Challenge for today says, volunteer to set up the company library. If you can't find the most recent due dilligence binder, the latest trade industry magazine with a profile of your boss, or timely reference books that you need to complete a project, consider volunteerting to establish a library for your business. Not only will it benefit others in your company, but it could be a career booster for you, especially if you not only brainstormed the idea but also got it approved and have sacrificed some personal time to spearhead the project. Your initiative and foresight most likely will set you apart as a visionary with a can-do attitude, the type of individual that many companies like to recruit and retain. Just For Today: Although this does not apply to my job or workplace I do go to work with a can-do attitude. Years ago Britney Spears sang a song, Oops I Did It Again. Today the song I sing to that same tune, OOPS I Missed it Again. I think our addict tried very hard but got lost in the game. Today is Day #196 of the Just For Today Challenge. I am also integrating the Live Happy into my daily Challenge. The Live Happy Challenge for today says to think of three tasks someone else could do and delegate them. When a job or project is too big for one brain and one set of hands, it's a good idea to delegate. If you're not a manager and this isn't your job, speak to your manager about it. The dictionary says that the word "delegate" means to entrust or hand over to another. When your workload is lighter, you can focus more intently on every aspect of your job and most likely do it better than when you were overloaded. Think of three tasks that you could easily hand off to someone else equally qualified to do them, and let him go to work. Allowing that person to honor you by doing the job to the best of his ability means that you won't micromanage him. Trust him and give him time to do his best work. Then, everyone will benefit. I work in a warehouse. Today's challenge wouldn't necessarily be something I could apply at my job, but others may be able to depending on the type of work that you do. I do ask for help if a task becomes too overwhelming for just one person to handle, but I am just not in any position to delegate the workload. Just For Today: If I feel overwhelmed on a task given to me, I do ask for help. The other day I mentioned in a post that I just want to be a regular mom without words like addiction, heroin, or even speaking about living and dying. I have no idea if I am doing this right or wrong. Is there a wrong or right way to be the parent of an addict? I have those who say, if your addict is mad at you then you are doing it right. Right now mine is still talking to me. I don't know. I tried calling him and it went to voice mail. Does that mean he is blocking me again? To some reading, I know when you see some words in posts you are no doubt led to click the X at the top of the post to stop reading. That is okay. I do not expect those who do not live this to even understand how we can talk pretty frank about words like living and dying. Unfortunately for us, it is something we think about daily when someone we love suffers this disease. This is something my family unit has been going through since roughly 2004/2005 which is the earliest we suspect our son had first started dabbling into the underworld of heroin. I wouldn't know what it is like to live daily without heroin and addiction. I wish for one day I could speak and the words would no longer be a part of my vocabulary. This week he's talked very candidly about life and death. It is weird. A normal mom would probably lose her mind, to me, it is something I prepare for each and every day. I do want to tell you as of today, we know he is struggling and the addiction is winning. I don't think it's too late, but the rest is up to him. He is an adult. I can only talk to him like that. I cannot make doctors appointments and force him to go to them. Last June one doctor after a CT Scan mentioned the C- word to him. At that time he had several spots on his prostate indicative to cancer. His liver is also bleeding. He never went back for follow ups. He still has several health matters that he didn't get checked in the months since he came home. Another potential health matter has shown up in the form of a growing mass in his chest. The stress and worry have led him back to dark places inside his mind. As of yesterday, I would say the voice of his addiction in his head is winning. His words to me, I can tell you he has chosen that if it is indeed cancer, then that is what it will be. He said he is comfortable knowing that he will die. He said he just doesn't care anymore. We are just learning about the mass in his chest while others knew. I always wonder, why is it that not one person minds calling us, or contacting us while he's doing bad things brought on by the addiction and telling us, DO YOU KNOW WHAT YOUR SON IS DOING? Yet others knew about a mass- a very big deal- and not one person called, texted or messaged us. WHY IS THAT? So, that is where we are at. What about you? Are you still struggling with an addiction? Do you know someone struggling with an addiction to drugs? Do you know of someone who has found recovery? Today is Day #195 of the Just For Today Challenge. I am also integrating the Live Happy into my daily Challenge. The Live Happy Challenge for today tells us to itemize for our boss and managers the tasks we love doing. Do you love pulling together data for your company's due diligence binders, working on payroll and reconciling the bank statements, writing press releases, researching, or working on the company website? Let your boss know what tasks you especially like. It's possible that just by letting your preferences be known that you will get more or that kind of work. And if you really like doing those tasks, you are probably happier and enthusiastic while at work. Those feelings can spread around the office. Just imagine if everyone is doing what they most like to do. Start an "I love my job" campaign. Get everyone on board. For all of us at our workplaces there are job tasks assigned that some of love and those that we don't particularly like doing. None of my departments job tasks involve those in the challenge, but I know what the challenge is asking. Put the jobs we love doing in order. For the past month they have been rotating us around so that none of us get stuck doing the same task each and everyday. I think it's working out like that. Just For Today: I will make a list of the job tasks in order and at the next one on one meeting will present them to my manager. All of us need some inspiration in our lives. For all of you, those struggling with your addiction, those rehabbing, those in recovery and to those just like me, the daily struggles of just loving someone addicted to powerful drugs remember, don't you ever quit! You hear me! NEVER!!! I found a poem to share today called, Don't Quit. It is a reminder that none of us should ever give up the fight! Any fight! Whatever fight! Fight harder! Today is Day #194 of the Just For Today Challenge. I am also integrating the Live Happy into my daily Challenge. The Live Happy Challenge for today says, think of tasks someone can do and ask them to help. A load is lighter when several people help carry it. Teamwork may seem incompatible with competition, but when competition is friendly it can spur everyone on toward a mutual goal. Helen Keller once noted that we can do little alone but together we can accomplish much.. The key is to find ways to spur everyone to compete to the fullest, doing their best, and always insisting that winners and losers stick to the rules of good sportsmanship. Celebrate the effort of each individual worker attempting to exceed his best level of accomplishment rather than feeling joyful because of the outcome (someone wins or loses). At my job they do little things to keep morale up. Our department is a great team and we help each other. 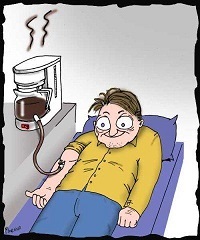 Just For Today: I will do my part to help my coworkers. I haven't suggested any book reading for about a month now. I didn't forget and I didn't give up searching for material. I found this suggested book read on another blog and I added it to my list of want to read books. If your child has a drug or alcohol issue, you may be struggling with questions: What do I do now? Can my marriage and my family survive this? 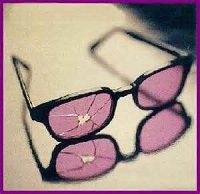 How do we hold it together when everything is falling apart? How do we help our child without wiping ourselves out financially? Do we need to create an estate plan with our addicted child in mind? Our child is completing treatment and will be coming home. What do we do now? Our child is in legal trouble-again. Do we let our child face the consequences, or do we step in to help? How do I protect myself while trying to save my child? 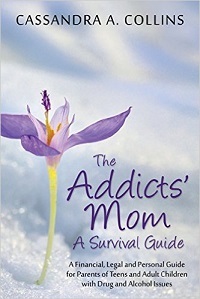 Part memoir and part survival manual, The Addicts' Mom tackles these tough questions to help parents cope, survive, and make smart choices through a child's addiction and recovery. Attorney Cassandra Collins combines her legal expertise with her experiences on the roller-coaster, heart-wrenching, learn-as-you-go journey through her own two sons' addictions. "We thought we were somehow immune from drug addiction. That happened to other families. We were just dealing with a rebellious teen. It would pass. We could handle it. Sometimes the greatest issues in life aren't brought on by the wrong answers, but in the questions we don't face or ask ourselves." Practical, straightforward, and honest, The Addicts' Mom takes on the tough issues of addiction-from treatment options, codependency, family dynamics, and the recovery process. It also provides useful advice and a comprehensive list of resources to help families wade through the legal and financial issues that often come with addiction. Above all else, The Addicts' Mom is written by a mom-a mom who survived her journey through her sons' addiction and came out on the other side. It is her hope that her experiences can help ease the pain of addiction for other families. Today is Day #193 of the Just For Today Challenge. I am also integrating the Live Happy into my daily Challenge. The Live Happy Challenge for today says to clean your desk top at the end of each day. Time management experts say that a clean desk is important for several reasons. You work more efficiently when you know where documents and tools are at all times rather than having to search through piles of disorganized material on your desktop. A clean desk signals to others that most likely you are an organized person with efficient and effective work habits, thus inspiring confidence. Don't wait to clean that desk off. Get yourself some garbage bags, several filing boxes, manila and hanging folders, labels, and an organizer for your to-do lists, addresses, and other data, and a calendar. Join the ranks of happily organized workers. I don't have a desk job at work. I can see the importance of the information given in todays challenge. I don't claim to have OCD behaviors but I know personally that even a little clutter can cause some disorganization. When we are disorganized it is hard to find something. Especially a little piece of paper I needed for work a few days ago. The feelings I got knowing I had put it down and it was shuffled around. Just For Today: I am starting to declutter my mind and my home. A member of your team helped you meet a deadline, stood in for you in a meeting, or even took on a part of your workload, so take the time to write her a thank-you note. Keep the tone professional and adhere to good writing standards, avoiding slang and words whose meaning might be misconstrued. Don't send your thank-you note by email. Although e-mails are appropriate for various types of office communication, a hand-written thank-you note is a personal expression of appreciation. By contrast, consider how a hastily written message of thanks, sent by e-mail, might be received. When you let workers know that you view them and their contributions as important to the team's success and take the time to write a thoughtful note, most likely you'll be rewarded with loyalty and assistance the next time you need it. I always thank those who have helped me in big ways but I have never given them a little note of thanks. Just For Today: I will let those who help me in big ways know with a thank you. Today is Day #191 of the Just For Today Challenge. I am also integrating the Live Happy into my daily Challenge. The Live Happy Challenge for today says we should single out one coworker each week and praise that person. When you see a coworker's extrodinary effort to get a project completed or to do a particular task well, offer some heartfelt praise. A word or two of encouragement can mean a lot to that person. Plus, people tend to be more productive when they know that their efforts are appreciated. If you are a manager or leader and don't feel you are getting the best effort from your workers, think about what you can do to raise the morale and set the tone for a friendlier, supportive work environment. Make it a priority to appropriately praise and reward dedication and effort on the job. Although I am not a manager or a supervisor I have worked in those positions in the past. I know how important it is for people to know that they are doing a good job. In my department at work there are several who stepped out into leadership position this past busy season. All of them did a great job! They were helpful and supportive even on days when they were stressed. Just For Today: I will remember to say thank you to coworkers today. Today I am posting an April A-Z Blogging update. I have completed several of my posts for the month. The first five days are complete. I am just excited to say that! I am waiting on two guest posts that week for the letter F and the letter G. I am so excited about sharing those two posts and the very special people who will be guest posting on those days! I am doing a happy dance. I am currently working on the posts for the second week of the April Challenge also. I have some surprise guests that week also that I am so excited about. I have started reaching out to a few for the third and fourth week of the challenge and the letters for that week in order to get prepared. I would like to thank those who have said yes to the guest posts that month. I feel honored to share your stories. April will be full of surprises. I hope you will join me that month here at The Chronicles of Loving a Heroin Addict. If you are new reading here you may be wondering about the excitement. I will be blogging in a challenge during the month of April. Stay tuned to the big Theme Reveal Day coming on March 20th. That will be the day we release what we will blogging about that month. In case you are wondering what this is. It is probably the biggest blogging event known to bloggers far and wide. 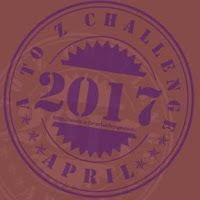 During that month several thousand bloggers will participate in a challenge to blog each day in April (except for Sundays). Each day is a letter of the alphabet. The challenge is to blog a topic relevant to each letter of the alphabet starting with the letter A on April 1st and ending with the letter Z on April 30th. The month of April will be the one year anniversary of our Memorial and Vigil that was held. If you are local you may remember seeing a page for this event last year. If you are on Facebook the video Memorial and Vigil highlights the events of that afternoon as we stood at 750 Baltimore St. on what we hoped would be the healing grounds. Some lit candles for our loved ones. Others left notes and posters for their loved ones. This year in April I am planning an anniversary event. It is still very early in the planning stages. 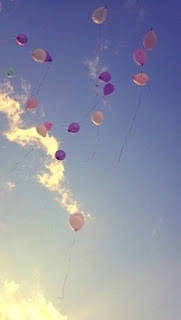 I have for about a year wanted to do a balloon release event. This year I am moving ahead with the plans to hold this event. Today is Day #189 of the Just For Today Challenge. I am also integrating the Live Happy into my daily Challenge. The Live Happy Challenge for today says, show up on time and prepared for meetings. Many working professionals feel that although meetings can be big time wasters, they are often necessary for the smooth functioning of their departments, businesses, or corporations. Leaders can use meetings to gather information and input from others, address a hot topic of concern to all gathered, or celebrate a milestone or a worker's accomplishments. A leader can also use a meeting to challenge, motivate, and inspire others. Whether you are the leader or an individual attending the meeting, take the time to prepare (if you are expected to provide input, ideas, or data) and always show up on time. Being on time and prepared demonstrates a high level of integrity and commitment. Be proud of yourself for making the effort. This doesn't just pertain to meetings. This can also mean showing up on time and ready to go to work. Showing your managers, supervisors and boss a little integrity means a lot. Just For Today: I will make the effort to be on time. I am part of a club. I wouldn't necessarily call it an elite club by any means. It certainly isn't a club that any of you would like to be part of. There are thousands of us all over the United States and abroad. I wasn't brought into this club as any choice of mine, but still the same here I am. In case you are wondering what club I am speaking about, I am known to many as an Addicts Mom. friends of those suffering from addiction to come out and join me at the crossroads. I stepped way outside of my comfort zone to do that. I am not one for public speaking or standing in the spotlight. I was tired. I was afraid. I was searching for some answers and offering up some help and with the promise that we will walk this together. Standing with me that day were several other mothers, parents, friends, sisters and relatives. Today a year later we are still together in this. A few of us have found recovery; others still struggling. We don't give up on each other. We are The Addicts Mom. Although apparently frowned upon now by some, YES we meet in church basements to share our stories and to talk with others who share our pain. Many of us who meet in church basements are not just moms. Many who meet are friends, parents, grandparents, sisters, brothers and spouses. We are held together by a special bond. We are all affected by this and we all love someone who suffers from an addiction drugs. YES some of us who meet in the church basements are walking those STEPS. 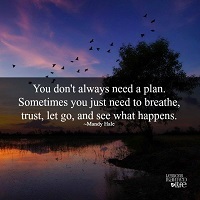 Many of us have gotten to that place where we can no longer deny and if but just to save a little piece of ourselves, and gain just a little peace and serenity even if it is only Just For Today, that is what we will do. Those STEPS for some of us is the only way to save ourselves from the insanity of loving an addict. Those STEPS for many is how we get from today to tomorrow. Those STEPS have brought some of us closer to our Higher Power. To many of us, those STEPS are very important. Some of us have learned to accept and admitted that we didn't cause this, we cannot fix this and we sure as heck cannot control the addicts that we love. If there is one thing we deserve it is just a little happiness and yes, that might only be just for today! We wish not one other parent, relative or friend ever had to go through this pain of loving an addict or ever knew what we on this side knows about when someone you love suffers from an addiction. 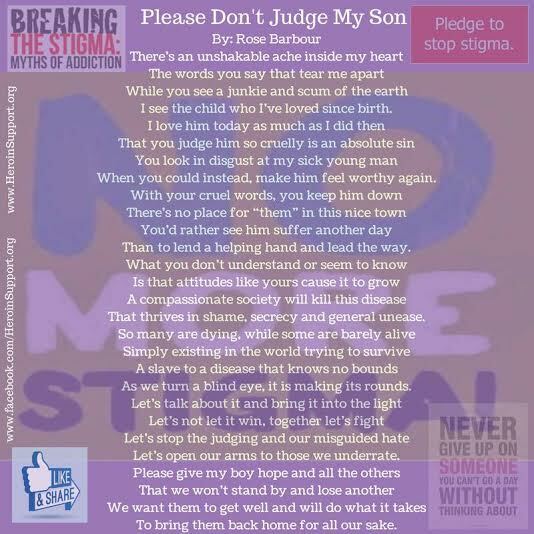 Many who read here are part of the silent majority who remain in the stigma of the disease. They too love someone who uses and abuses drugs. If you live close by to Martinsburg, WV or Berkeley County, WV I invite you today to meet us in the church basement. We meet in the church basement every Sunday at 6 PM at Trinity United Methodist Church here in Martinsburg. The address is 220 W. Martin St. You may not feel like being there, but you will be glad that you came. The STEPS are optional! Today is Day #188 of the Just For Today Challenge. I am also integrating the Live Happy into my daily Challenge. The Live Happy Challenge for today says to greet a cranky coworker with a plate of cookies. Bake some cookies in the office microwave or bring them from home. If someone in your office often scowls, chronically complains, or flies into a hissy fit with little or no provocation, offer him/her a plate of warm chocolate chip or peanut butter cookies. Even if they are refused, you can be assured that you at least tried to bring a little pleasure into that person's life. The gesture may work or it may not. Some people are just so used to being unhappy and feeling like the whole world is against them that they are outside their comfort zone when someone does something unexpected and nice for them. The truth is that they are more likely than not hungry for friendship and attention. We all have a bad day here and there but I know there are some who have more days than happy ones and show up for work moody every day. I had a boss like that once. What a great idea that I never thought of, just take them a plate of cookies. Just For Today: Put a smile on someone's face with a plate of cookies! Today is Day #187 of the Just For Today Challenge. I am also integrating the Live Happy into my daily Challenge. The Live Happy Challenge for today says we need to admit to our superiors when we have made a mistake. It is often difficult to admit to your superiors that you made a mistake. However, doing so demonstrates your sense of responsibility and willingness to shoulder the blame. Taking responsibility for a screw up by you or your team shows your managers and boss that you are a person with values and moral principles. Although a mistake has been made, you'll be better off admitting it and moving forward than deceiving, lying, or covering up the error, all of which can have disastrous consequences for you later where the truth is finally found out. Now, this can be a big oops or a little oops. What if that oops is going to get you written up? A few months ago I made a mistake on my job when I counted something to zero. It reflected a zero balance on our inventory. When it was brought to my attention I immediately apologized. It was my mistake. I owned it. I was sorry for it. I was sorry that another had to go recount that entire location to correct my mistake. I was happy that it was used as a training tool for me. I will make sure in the future that I pay better attention. Just For Today: I will admit when I made a mistake, even when the only words I can offer is I am sorry. Up For Discussion: Why Do They Have to Say They Are Suicidal First? Today's Up For Discussion Post is a question I have heard for months now. Someone suffering the disease of addiction wants help, they are already on that step, yet in order to get the help and a bed in a treatment center, they have to tell the crisis team that they are suicidal. People are so desperate for help whether or not they are suicidal that is what they are saying to get the help. No one should have to forced into saying they are if they are only seeking help for their addiction, should they? Say you are having a heart attack. You get to the hospital and in order for them to treat you, you have to say "the pain is so unbearable I am going to kill myself" in order for triage to start. Does that sound stupid? Well, then why is it different forcing someone suffering addiction, to say that? A few have been known to try to detox and they are in withdrawal so yes, they are undoubtedly in severe pain at the time they reach out to the crisis team. In My Opinion: This will now place yet one other stigma on those who want to get help for their addiction. They are now categorized into the file of, suicidal. Here is how I see that playing out. Years down the road after the person is treated and living life recovered say they call 9-1-1 to report someone breaking into their home. BUT they are also now labeled with "being suicidal in the past." How will this workout? What will be the outcome? I am just wondering about your feelings and opinion on this. Should someone who suffer's the disease of addiction have to say, "I am suicidal" before receiving help and treatment? The Challenges on Finding Happiness Pursuing Your Dreams have come to an end. Were you able to connect with any of the challenges? Have you tried any suggestions offered? What did you like or dislike from the suggestions given? The next set of Challenges is about Promoting Happiness in the Workplace. Personally I think we can all use some help and suggestions on that subject, can't we? For many of us we have to work to provide for our home and our families. 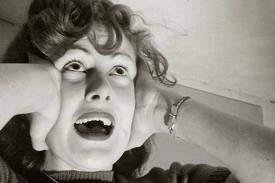 Everyday life is a struggle balancing our homes, our budgets, our checkbooks and meeting our over all needs is stressful. Our workplace should bring us just a bit of happiness, peace and joy but in too many environments it doesn't happen like that. I like my job. I like those I work with. I think we are a great team. I hope to find some challenges over the coming days to help me everyday at my job, even if it is just to smile. Today is Day #185 of the Just For Today Challenge. I am also integrating the Live Happy into my daily Challenge. 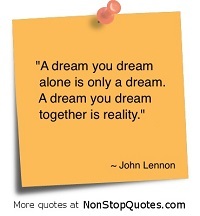 The Live Happy Challenge for today says, support your spouse's dream. You love your spouse and want his dream to be fulfilled, too. Think of several ways you could help him/her realize their deepest desires. Perhaps he or she always wanted to see a baseball game in all the National League Stadiums west of the Rockies. You could suggest that next year he/she take a summer vacation with his best buddy and go on a baseball junket with maps, time lines, and cost estimates. Provided your relationship is firmly rooted in trust, vacations apart can be fun and healthy. 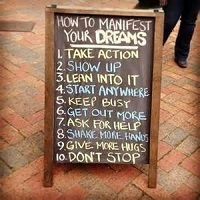 Spell out other ways you can envision supporting his dreams. Then, of course, you can talk about yours. Now, I am not so sure about separate vacations thing, but in supporting your spouses dream, yes. When both spouses work outside of the home I think it is important to vacation, vacate, and disconnect together. In a relationship it is very important to support each other. Just For Today: I support my husbands dreams, passions and any endeavor he has. Today marks a milestone in the challenges of 365 Ways to Live Happy. Today we are at the halfway mark. For the past several months I have been doing the Live Happy Challenges as part of my Just For Today. I am doing these as part of a Challenge to Myself. 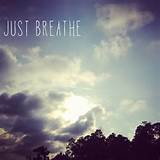 Several months ago we were challenged at Nar Anon to think of ways each day to bring just a little peace and serenity into our lives even if those challenges were Just for a day. Today. happiness Everyday several years ago. I decided to include them into my challenge. After a couple of days I decided to share them here to spread some happiness and ways to live happy to others by blogging the challenges. Today we are halfway through the challenges. Some of the challenges don't seem to fit in for right now, but I've been able to go back to some of them. Take for instance those on Happiness While Traveling. We don't travel outside of the U.S. but I can find ways of integrating the steps into our day trips or weekend trips. Hopefully you have been able to get some ideas from the challenges to help you. In just two days we will be moving on to another section of challenges from the book. If you have missed them and want to look back, they are listed on the sidebar of this blog under, Live Happy. Have you enjoyed the challenges? Have you found something interesting? Have you tried any of the suggestions? Today is Day #183 of the Just For Today Challenge. I am also integrating the Live Happy into my daily Challenge. The Live Happy Challenge for today says list specific ways you will celebrate achieving your dream. When you finally make your dream a reality how will you celebrate to mark the occasion? Will you buy yourself a piece of expensive jewelry you've been wanting? OR, will you escape to Monte Carlo for a long weekend? Perhaps you want to do something physical like climb a mountain. Make celebration an important activity in the process of realizing your dream. You are marking a milestone and getting ready for the next part of your great adventure because a dream has a way of spawning others. So, if tomorrow your dream of opening a business, or maybe becoming an entrepreneur, or a writer, or whatever your dream may be became a reality, how would celebrate it? Just For Today: I celebrate all the milestones in both the journey and in dreams becoming realities. Today is Day #182 of the Just For Today Challenge. I am also integrating the Live Happy into my daily Challenge. The Live Happy Challenge for today says to put a talisman on your desk to remind you of your dream. Have you ever broken the wishbone on a turkey with someone for luck? Maybe you have always wanted lots of money, not for merely having it but rather for the purpose of being able to exchange it for other things important to you. Consider getting a talisman or charm for wealth, abundance, and success. A talisman is simply an object intended to ward off evil and bring good luck. If you choose to make your money talisman, do so during the waxing phase of the moon. When you are ready to charge it, hold the talisman in your right hand (which you place facing up in your left hand) and charge it with prayers, deep breathing, visualization of it's purpose, and infusion of your life force energy. When not in use, keep it in a bag near where you work or on your desk to remind you of your pursuing dream. I don't know how old you are, but do you remember the 70's and the lucky rabbits foot? I had several rabbits feet key chains that I carried with me everywhere. 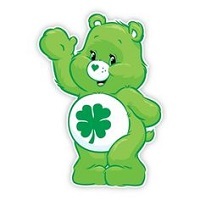 The four leaf clover is another example of a lucky charm. I had a friend that put one in resin to preserve it. Another is a horseshoe hung over a door. Do you believe in lucky charms? Do you carry a lucky charm? Just For Today: I want to believe that luck is on my side. "Money will make me happy." I read this poem several years back and while I don't consider myself part of the Lost Generation, my children are. Today is Day #181 of the Just For Today Challenge. I am also integrating the Live Happy into my daily Challenge. The Live Happy Challenge for today says ask six friends to support your dream endeavor. You have dreams and so do your friends. Choose six friends and ask them if they would be interested in having a team to support them in pursuing their dreams. Then call a meeting of everyone and have a discussion of how each of you could best serve each other as all of you deliberately go after your dreams. Will you call each other everyday to talk about progress and concrete issues? Will you meet on Saturdays for bagels and coffee to discuss overcoming any obstacles that some or all of you have faced during the week? Knowing you have close-knit network of individuals committed to help you realize your heart's desire can help you stay motivated and on course. Just For Today: I will find a dream team to support my endeavor! I was surprised to find in my inbox an email from Change dot org where our petition is listed to say that the petition has picked up some more signatures. In May we turned the petition in to the City Officials at a council meeting. Soon after that city meeting we learned about the Community Recovery Resource Center which would open here. We made plans for a day to deliver the petition to the county but shortly thereafter the county pulled out their plans of making 750 Baltimore St. a treatment center. Their decision to do that stung so many of us who were hoping and praying to see this treatment center a reality for our own local people suffering from addiction. After that decision, the petition took flight once again and more signatures poured in. I never pulled the petition down. It is still there. I have no plans of taking it down because we need a treatment center here. There is no treatment on demand here in our county. When someone is ready for help there needs to be a bed for them at that very moment. The clock starts ticking the minute they reach out for help. We on this side know this is only a short time because they can quickly change their minds, and it is often at that time while waiting on a bed so many have died from this drug. There is nothing here so those affected by this addiction have to go many miles away- four, five, six and more hours just to get a bed. Those beds have waiting lists. How many of our own locals have lost their lives just waiting on a bed or a ride to get help? Where this addiction is concerned, why are we still treating our people in shame? Why do we have to send them away like in the days when the young unwed pregnant women went away to have their babies because of the stigma on their family? Shame and Blame has never been the answer to any problem- ever. I don't deny our Officials are paying attention and that there are things now in place that is needed. The Resource Center, The Day Report Center, The Drug Courts, The Detox Center which is coming soon- all of that is needed but the very first step in treatment is a bed and a treatment center. Today is Day #179 of the Just For Today Challenge. I am also integrating the Live Happy into my daily Challenge. The Live Happy Challenge for today says, post on your mirror 5 factors vital to your success. Think of five factors that are absolutely vital to the success of your dream. Write them on sticky paper or note cards and place them where you can see and think about them. For example, having a dream of owning your own business might mean knowing everything you can possibly know about your product or service and the demographic of your ideal customer, having a business plan, finding enough capital, and establishing the proper price point for your product. Determining the optimum business location or having a great website will also be important. You want to start a business that succeeds. Knowing what is vital to that success will help you get those things before you launch your company. Many years ago I wrote a short story. It's never been submitted anywhere. I've let a few friends read it who encouraged me to do something with it. It seems every time I tried, something came a long and set me back. I sent it out a few years ago for some editing. My plan was to publish it on Kindle. I got it back and it still sets in a folder. Reading these challenges for making a dream come true but it seems each time I get close enough another set back happens. I always took this as it just wasn't meant to be. Just For Today: One day I will!!! Today is Day #178 of the Just For Today Challenge. I am also integrating the Live Happy into my daily Challenge. The Live Happy Challenge for today says we need to create a manifestation board for our dreams. Growing up I can remember saying, "I can't do this." My mom would always reassure me, "You can do anything you set your mind to do." I now know her words were telling me, don't ever give up on myself or my dreams and as long as I kept saying I can't do it, I would never manifest it. A sheet of poster paper or foam board will serve as a board on which you can paste images, inspirational words, goals, and dates for accomplishing goals as well as ideas of new directions to take your dream. Maybe you want to find a way to help your children's school establish a theatrical group or an arts program. Perhaps you are an artist and can guide children in making masks, costumes, stage sets, and the like. Cut pictures of those images from magazines and put them on your board. Do you know other parents or artist friends and teachers who could help you launch such a program? Write their names on your board. Check them off as you call and make your pitch. You'll soon learn that a dream doesn't have to be a solo dream; it can come about through a team working together on a community held vision. Write, I can do anything I set my mind to on a piece of paper. Put the paper on your mirror or carry it with you because you can do anything if you want it bad enough. Never doubt yourself. If you want it bad enough, you can make your dreams come true. Just For Today: I will stop saying, I cannot do this! I haven't posted an Up For Discussion Post in awhile. Today I decided to post one because our local groups are losing their focus. They seem to have lost the real purpose we decided to raise our voice here. So, I wanted to explain a little. Lately, in Facebook messages, I have been receiving a lot of messages relating to political unrest among friends. So, today the Blogging From A-Z April Challenge revealed that this year there will be no sign up list. I understand their reason. Through the years spammers have signed up on the link list as well as those who sign up, but then do not participate in the challenge or their page led to a dead link. This raised a lot of questions and am hoping that I won't be a bother to the team with the questions I have. As I am understanding it, each day of the challenge they will post the letter of the day. We go there then post the link to our daily post on that page. I always loved that I was able to find and follow new blogs of interest well before the challenge. A goal I had in mind for this year was finding other blogs relating to addiction; as well as my link would also gain interest to those likewise. I am assuming this year without the signup I will not be able to do this. I don't do twitter so I won't have the option of tweeting out posts.